I am honored to be one of three authors -- along with David W. Landrum and Sean Monaghan -- in Black Denim Lit No. 2, edited by Christopher T. Garry. My story "Scent of Darkness" is from a work in progress which is a series of related stories set in an unnamed Midwestern town. "Scent of Darkness," like all but one of the stories so far, takes place in the 1950s. Other stories from the series have appeared in the Tulane Review, Noctua Review and Constellations. They are written in a style that has become known as Midwestern Gothic, although when I began writing them in 2012 I hadn't heard of that term. Ultimately I plan to bring the stories out in some sort of conceptual novel, the grand scheme of which is still in a formative stage. Ted Morrissey holds a Ph.D. in English studies and is an adjunct lecturer in English at University of Illinois Springfield and in the Writing and Publishing Program at Benedictine University Springfield, where he's a reader for Quiddity international literary journal and public-radio program. He is the author of the novels An Untimely Frost and Men of Winter, as well as the novelette Figures in Blue. His short fiction has appeared in nearly twenty journals, including Glimmer Train Stories, The Chariton Review, and PANK. He's also published the monograph, The Beowulf Poet and His Real Monsters. Please see TedMorrissey.com for further information. 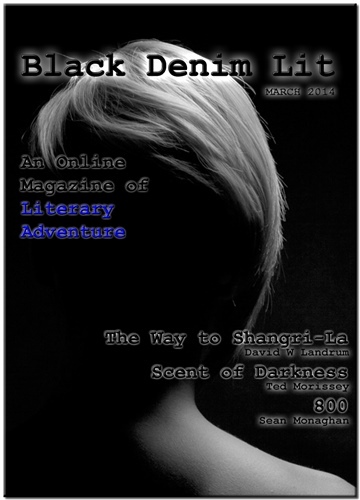 The Black Denim Lit Stories by Ted Morrissey: "Scent of Darkness" - Mar, 2014. March 20, 2014 By Amazon Reviewer "Lynne" This review is from: Black Denim Lit #2 (Kindle Edition) Very interesting stuff from a promising independent journal. You should give it a try, and make sure to visit their blog.